The only all-in-one database of over 49,100 cities, towns, villages and townlands in Ireland. Includes linked county, province, grid reference, latitude-longitude, Eircode key and more. Ready to use in SQL, CSV and Excel format. Get clean, consistent and well-organised data for the whole Republic of Ireland in one single file, with no need for lookups or complex conversions. 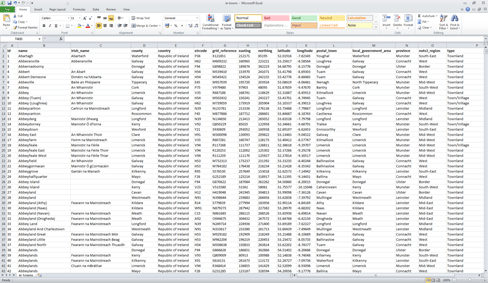 All 49,199 records include including county, latitude-longitude, Eircode key, government area, province, and region. You can have complete confidence in the quality and accuracy of our data. All records have been updated using the latest information from Ordnance Survey, the Central Statistics Office and the Northern Ireland Statistics and Research Agency. The last complete refresh was on the 7th April 2019. Powering location searches and mapping. Interfacing with resource planning and other internal systems and databases. Data verification and quality assurance checks. 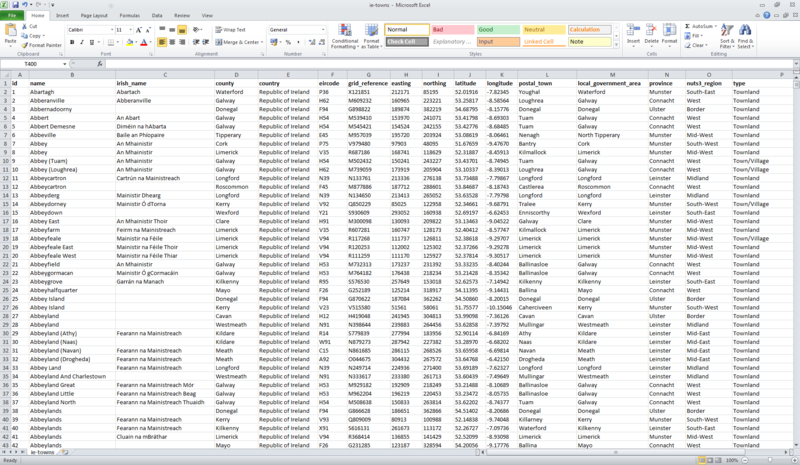 All populated places and townlands recognised by the Irish Government are listed in the data, with no duplicates. It covers all 26 counties in the RoI, with no gaps in the data. Immediately after purchase you'll be taken to a webpage with a permanent link to download your data. We'll also email you a copy of the download link (along with a formal receipt) so you've always got access to the data. The last update was made on the 7th April 2019 . This release was a full quarterly refresh which updated place names, coordinates, and accompanying postcodes. We use the latest official information from Government sources only. The data undergoes a complete refresh every quarter and undergoes regression testing and quality assurance checks before each release. You can download a sample or check the data with the live online search. © IrelandTownsList.com 2019. Contains Ordnance Survey Ireland and Central Statistics Office data. Request received 2019-04-26 02:47:01 UTC from 3.95.23.35 and served by Digital Ocean.